With so many leaks happening every other day, how could a HTC device be in hiding. And now PhoneArena has got their hands over a mysterious HTC smartphone running Android Ice Cream Sandwich with support of HTC Sense 4.0. This unnamed device may turn out to a Droid Incredible 3 because the back of the device is a little different than any other HTC device but the overall look is same as that of any other HTC device. Going by the specifications this HTC device is running on a 1.2 GHz Snapdragon processor supported by a 1GB RAM. There is an 8 MP camera at the rear and a VGA front-facing camera for video calls. 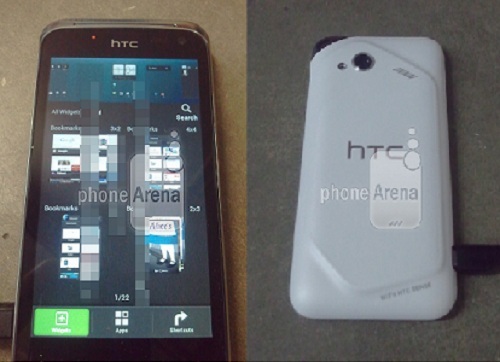 This HTC device is having an AMOLED screen rather than the regular S-LCD screen found on rest of the HTC devices. The device also has a LTE radio overboard thus it may be heading over to the US markets soon. Even though the device is running on Android ICS, it still has 4 physical button rather than 3 capacitive ones. But as we can see, this is only a prototype device and thus many of the looks may be tweaked before the device officially arrives. When can this device arrive? Well we don’t expect it to arrive at the upcoming Mobile World Congress (MWC) but anytime around mid-2012.